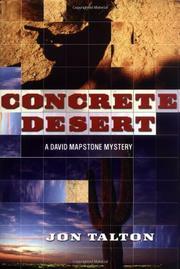 The road’s been bumpy recently for melancholic history teacher/sleuth David Mapstone. His wife has left him, his failure to get tenure at San Diego State has left him virtually jobless, and now here’s Julie Riding, slightly drunk, banging on his door, promising trouble. Mapstone hasn’t seen Julie since they were college sweethearts at Arizona State, a relationship she terminated with heartbreaking casualness. That was 20 years ago, but she still has those ultrapersuasive legs. From Maricopa County Chief Deputy Mike Peralta, Julie’s learned that Mapstone has signed on for a temporary investigative gig, and she figures that qualifies him to find her vanished sister, Phaedra. Reluctantly—he knows the local cops won’t like him for it—Mapstone agrees to sniff around. Pretty soon, he’s sniffed out a brisk Phoenix-area cocaine operation as well as a motive for Phaedra’s murder. By that time he’s neck-deep in complications involving: (1) a seriously angry and very powerful politician; (2) a vintage serial killer called “The Creeper,” and (3) webs of deceit wherever he turns. Meantime, tempting Julie has all but vanished except for a series of enigmatic phone calls. Mapstone, however, is one of those neo-noir figures not easily deterred in his search for the truth, which when he finds it turns out to be as gloomy as the neo-noir genre demands. Though he’s certainly depressive enough, Mapstone, out of Archer, out of Marlowe, lacks both the style and substance that made those dark-natured Mean Street walkers memorable. A lackluster debut.